Are You Ready to Join Our Rewards Program? Do you love URBANfusion Skippack’s selection of unique products? We carry elegant bangles by Crislu, luxurious Lollia fragrances, and gorgeous PANDORA rings in our Montgomery County boutique! We are always excited to help our loyal customers. That’s why we started an in-store Rewards Program. With this simple program, you can get money back just for buying PANDORA and other URBANfusion products at our boutique! Spend $250 on purchases at URBANfusion Skippack. Receive a $25 credit for our boutique. Spend your reward on qualifying products. Rewards are cumulative throughout the year, so you can earn $25 each quarter. That’s up to $100 in rewards every year! With that much credit, you can get more of your favorite accessories. When’s the right occasion to buy products from URBANfusion Skippack? Your loved ones will adore jewelry, homeware, and personal items from our store — and you will love earning rewards! Our boutique offers plenty of options for gift shopping and personal pampering. Although you won’t be able to spend your store credit on PANDORA jewelry in our Montgomery County store, there are so many choices available. Wind & Fire creates eco-sustainable jewelry made from recycled brass and finished with antique gold and silver. 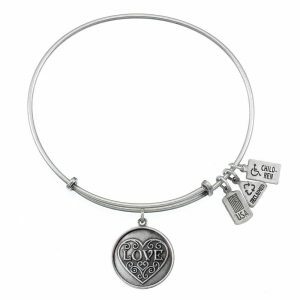 Their Love Filigree Heart Charm Bangle will help you to continue your journey while knowing that you are cherished! Musee’s hand pressed bath balms are crafted with natural and essential oils. These fragrant bath balms have a fun surprise inside: a bouncy ball, a candle, a rough cut diamond, and more! Apple Park offers adorable and all-natural baby products, including precious baby dolls, huggable blankies, and cuddly toys. Yala creates comfortable, effortlessly elegant clothing without leaving a big carbon footprint. Their flirty Adrianna Dress with a Black Sparrow Print is made with silky-soft bamboo fabric — and yes, it has pockets! To find out more about the URBANfusion Skippack Rewards Program and our fantastic selection of products, call us today at 610-572-1326!